The Slide at the ArcelorMittal Orbit, located at Queen Elizabeth Olympic Park in London, opens to the public on 24 June 2016. 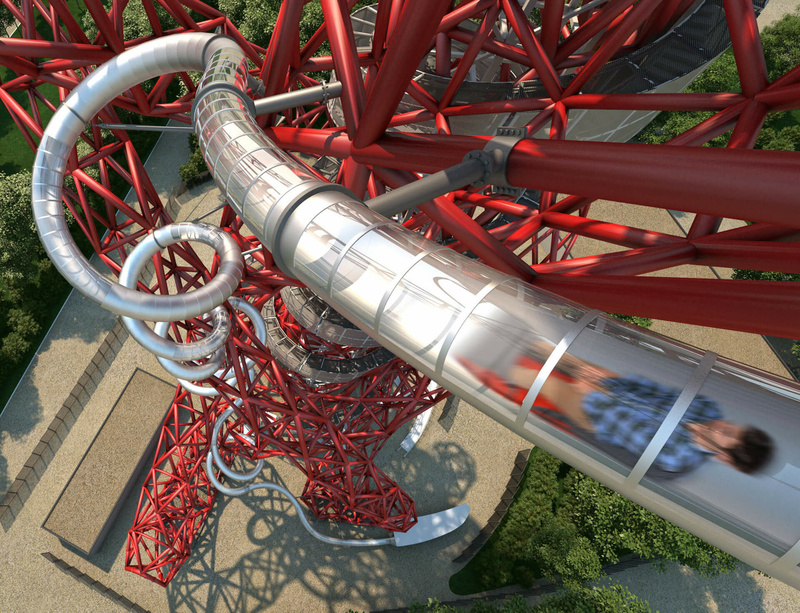 Designed by Carsten Höller at the invitation of Anish Kapoor, creator of the ArcelorMittal Orbit, The Slide, measuring 178m long and 76m high, will be the world’s tallest and longest tunnel slide. Created by Anish Kapoor and Cecil Balmond, the magnificent looping structure of the ArcelorMittal Orbit is an iconic symbol of Queen Elizabeth Olympic Park and the London 2012 Games. Visitors will now be able to travel down the UK’s tallest public artwork, twisting and turning twelve times, finishing with a 50 metre straight run to the ground. In the forty-second trip, riders are expected to hit speeds of up to fifteen miles per hour. For more information on the collaboration, please visit: www.arcelormittalorbit.com.